Article XI recalls the joyous emancipatory fervor of Charlie Haden Liberation Music Orchestra and its commitment to sending a message. The eleven-piece band includes four musicians from the Beats & Pieces payroll, but seems less indebted to the influence of Loose Tubes in favour of older influences in the radical mode of the politicised avant garde. It sounds like an older record, looser than many contemporary jazz albums. Compositionally it feels a bit more substantial than Beats & Pieces, with less reliance on repetition and arrangement, stronger melodic themes and material and a looser space for improvisation with a keen interest in letting each individual voice sing out in turn. Guitarist, band-leader and composer Anton Hunter sent each player their own short melody and incorporated their responses. It’s fun to try to tease out which bits might be which. Five of the seven tracks were recorded live at the Vortex by the prolific Alex Bonney, and two in Manchester by Paul Allen. The live feel gives the album a sense of special occasion underlining the urgency of its political message. Article 11 of the European Convention on Human Rights states “Everyone has the right to freedom of peaceful assembly and to freedom of association with others, including the right to form and to join trade unions for the protection of their interests.” Whether or not you believe Human Rights are a human right, the freedoms enshrined in Article 11 are all under threat of being done away with, and we’re letting it happen. Retaken opens the album with big ensemble themes that evoke the Liberation Orchestra’s feeling of gathering and unity. Peaceful Assembly, as indicated by the title, is a cornerstone track with the overcoming funereal bittersweetness of New Orleans. The impressive pacing and patient development over twelve minutes really takes you on a journey. Graham South is a great choice for the trumpet solo with his vulnerable tone alongside twinkling chordal guitar, rich harmony and confident group improvisation. I Almost Told You pairs him with Nick Walters, whose trumpet has a more angular and boppier, snappier funk-Miles tone ahead of the beat that complements the huskier vulnerability of Nick Walters slightly behind it. 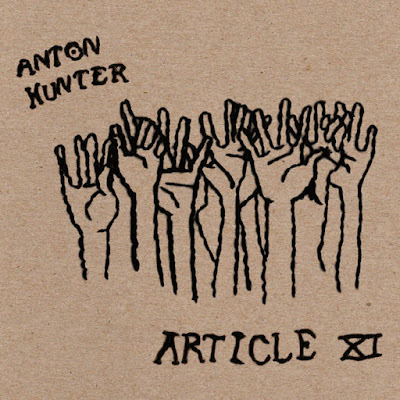 Band-leader Anton Hunter being a guitarist, and his arresting playing with Beats & Pieces, might have led us to expect those signature washes of electronic guitar sound or densely arrayed math-rock riffing, but his presence is subtle and mostly supportive. It’s a brass album not a guitar album. Guitar solos are few and recall the Django Reinhardt school more than post-Derek Bailey tactility. Mostly the guitar adds a chordal-percussive texturing to underpin and offset the richness of the brass sound. C# makes the world a better place has a wonderfully thick texture, all stasis and atmosphere, with a piercing dissonant feedback and the slow development of horns introduced delicately, culminating in a rinsing three-note motif. Several tracks culminate suddenly and stop like this. Eight minutes into Innards of Atoms a superbly vocable theme is driven home, the guitar doubling the phrase and taken up by the horns, the huge hendecatet (eleven-piece ensemble) sound variegated by individual ornamentations. They saved the best for last at the end of closing track Not The Kind of Jazz You Like, with a tantalisingly short, tremendous guitar figure or riff that only comes in for one minute, and what a minute! A spidery, sinuous, circular math guitar hero moment of angular awesomeness you want to export into Logic and loop. It makes you wish there had been more guitar! Article XI is released on February 9 on Efpi Records.